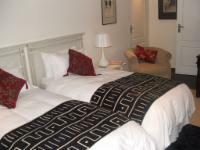 For luxurious accommodation in Sandton, one needs to look no further than No 5 On Franschoek Guesthouse. Set on a Greenbelt in a tranquil suburb north of JHB only minutes away from the office parks and business premises of Rivonia, Sunninghill, Woodmead, Sandton and Fourways offering functionality for modern travelling.Nicki and Judith are offering quality accommodation for travellers to Sandton / Gauteng in South Africa with the opportunity to relax and unwind in safety and style.No 5 On Franschoek guesthouse in Sandton offers guests the following facilities and services:Continental and English breakfasts offered daily sparkling pool secure parking on-site laundry and dry cleaning by arrangement Balcony overlooking an Indigenous garden thatched lapa in garden with access into the Greenbelt for nature walks, The luxurious rooms each have their own access, have a modern contemporary feel, are en-suite with showers and are equipped with DSTV, fridge, microwave, hairdryers and a hospitality tray with tea / coffee facilities. Beds are queen sized Free WiFi. Our delicious breakfasts, hot “to order” are served either in the dining room or on the patio which overlooks the sparkling pool. SAVE 30% Max the weekend! Stay between 03 Mar 2019 and 31 Dec 2019 and get 30% off. Valid every Fri,Sat,Sun. .Includes extras to the value of R300 for free..
A minimum booking amount of R753 is required. Book before 30 Nov 2019 to receive this special. Stay between 03 Mar 2019 and 31 Jan 2020 and get 30% off. Valid every Mon,Tue,Wed,Thu. .Includes extras to the value of R300 for free..
Everything was good, no complaints. Room is comfortable and had everything we needed. Will be back. Room was big and comfortable. Very beautiful gardens with a fish pond. Big Thanks to Nicky for arranging for us to arrive later than expected!! We loved No 5 on Franshoek and if we can we will be back, the staff were fantastic, it was quiet and peacefull, safe and secure and the attention to detail in our room was brilliant. Thanks very much. So nice, hosts were terrific. Every time I go back to J'bg this is a place I will try to stay. Good value. No 5 on Franschoek is 13.5km from the centre of Johannesburg , the nearest airport 17.8km (Lanseria International Airport).